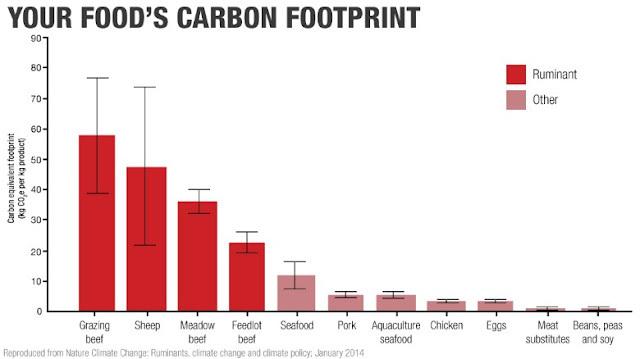 Our good friend Kristie sent this report, which reaches conclusions along the same lines as the above graph: 1 kilogram of lamb produces 39 kg of greenhouse gasses. 1 kg of beef produces 27kg GHG, cheese produces 14, pork 12, farmed salmon 12, chicken 7, and eggs 5. One kilogram of tofu produces 1 kg greenhouse gasses. Now imagine going to a college campus or your local grocery store. Imagine giving the people there this information. What do you think they'll hear? More importantly, what do you think they'll change, if anything? Herb Simon won the Nobel Prize for his simple but important insight into human behavior: We don't make optimal choices. We make satisfactory and sufficient choices. We are actively delusional if we think any significant proportion of people are going to move from burgers and steak to tofu. 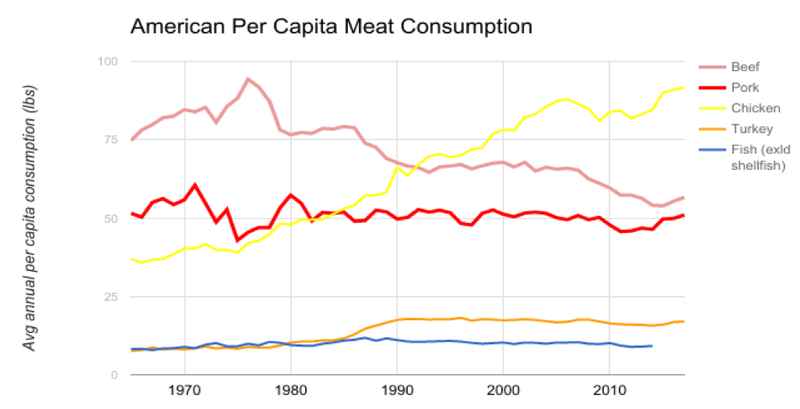 This delusion helps feed the ongoing move from red meat to chicken. 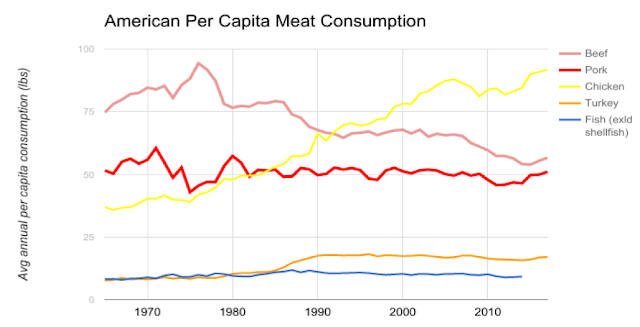 It is why, in 2017, more than 40 years after the publication of Animal Liberation, the average person in the US will eat more animals and cause more suffering than ever before in history. Luckily, a growing number of people are recognizing our failure to alter the trajectory of animal consumption. It is why more work and money are going to welfare reform, as well as the supply side. But I believe we also need to work on the demand side, with a specific focus on actively and realistically opposing the increase in animal consumption.